As I assume that penny share will start performing when index slide from his year highs. Today we book our 13th profit booking in this blog. We book 29.78 % profit in sumeru industry we buy sumeru industry @ 0.47 at 03.09.2010 and today 16.11.2010 price of sumeru industry is 0.61 so total 29.78 % profit is there. This week no new penny share entry in minimum price 20 share concept and no any new entry in FSP series. 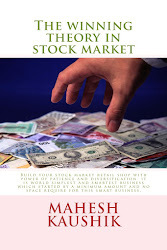 Traders are welcome to visit my new blog http://200dmagenius.blogspot.com/ specially made for traders not for investor.